The one who does the least amount of work is the one who is in charge. 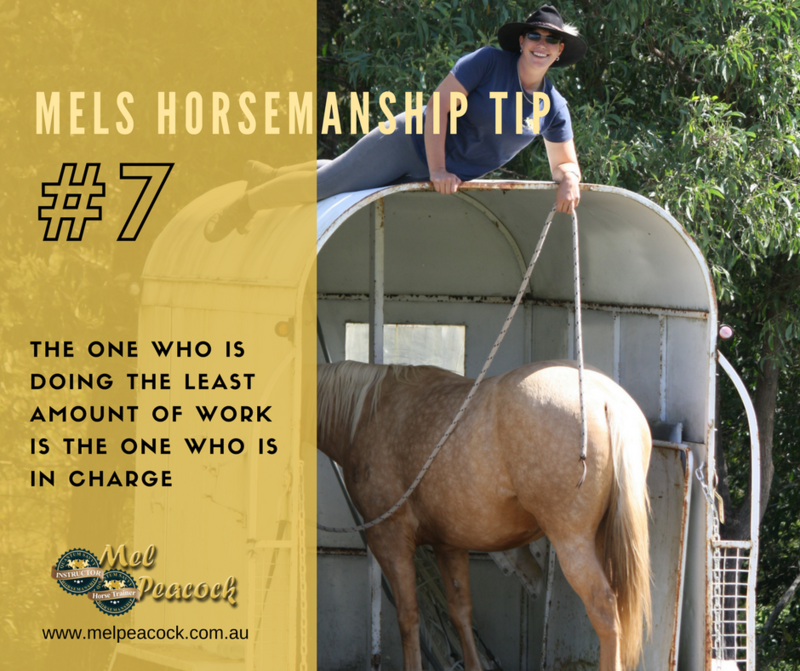 Our horses are very good at making it look like they are doing what we are asking of them, but if you find that you are doing more work than your horse to get the task done, then it could be that your horse is getting you do to the task instead. Have you ever seen someone trying to get a lazy horse to go? They finish up puffed out and exhausted whilst the horse hasn’t so much as raised a sweat. Why does this matter? When you are out riding your horse, what do you want your horse listening to – your direction or his instincts? If a horse feels that he is able to move you around or cause you to put in more effort then he does, then he will think that he is the brains of the crew. So when it comes to staying safe, he is going to be more apt to do what he thinks is best rather than listen to you. Next time you are saddling up and need to change sides to do the girth up, try to keep your feet still and ask your horse to move around you instead of you moving around him. It might make all the difference to your safety in the saddle later on.